Happy March, everyone! 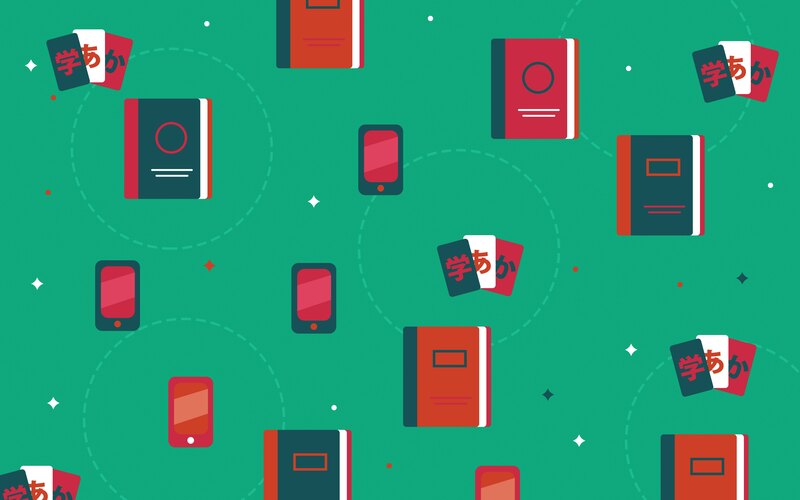 The time has come for another installment of our new Japanese learning resources series. It was such a great month for new study tools that this list is pretty long. There are listening, writing, and reading tools for all! Our friends over at Jalup, who we've talked about in this series before, have come out with a new ongoing project called Jalup Listen. It's like a mashup of Satori Reader and Bilingual News, and is only accessible past the first few episodes via their Patreon. Each audio recording has an accompanying script in Japanese with level tags to show how difficult the material is. Patrons are able to ask questions about vocabulary, grammar, pronunciation, or the topic being discussed. These questions can be in Japanese or English, but we highly recommend testing your Japanese and having it corrected while you learn. Along with Jalup Listen, there is another, similar type of recording called The Adam & Yuki Show. These are short (1–2 minute) conversations between Adam, the creator, and Yuki, the voice actor who provides the audio for all of Jalup. Audio is downloadable for patrons and the hope is that casual, simple listening practice will help learners ease into these aspects of Japanese better. While there isn't too much content yet, the conversations are interesting, well-paced, and more natural than most of the other "English speaker talks to Japanese speaker" audio I've heard before. All of the content Jalup comes up with is usually high quality, so we're excited to see where these two series go. Even though the name says "Learn Japanese in 24 Hours," that's not the goal (we see what you did with that typo). 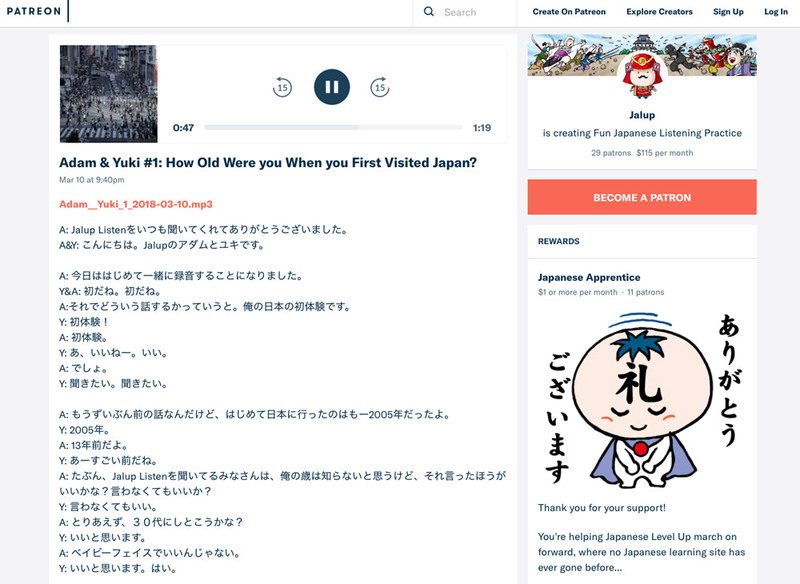 JapanesePod101, the very popular Japanese learning site, podcast, and chain-email provider, has begun broadcasting a twenty-four hour stream on YouTube. Even though the name says "Learn Japanese in 24 Hours," that's not the goal (we see what you did with that typo). 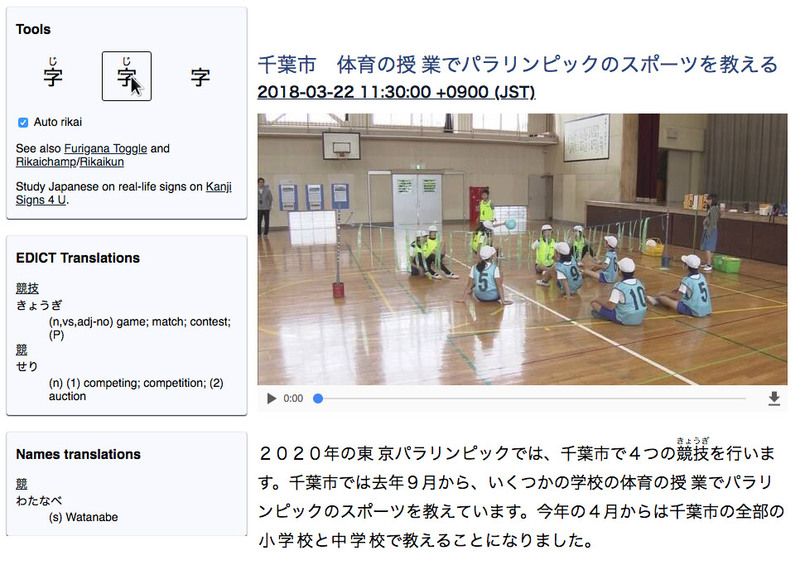 It's not actually "live" in the typical streaming sense—it's more like a TV station for people interested in learning about Japanese language and culture. Different pre-recorded, short programs explore tourist areas, cultural norms, food, and teach beginner vocabulary. They also have sections dedicated to learning new words. Some are spoken mostly in Japanese with English subtitles, so it isn't just for beginners, and there are tons of random things you can learn just by having it on in the background. This stream won't teach you Japanese in 24 hours, but it is like an NHK channel with only one advertiser popping up each time you watch. The content seems to be limited (I've seen the same convenience store informational pop up twice so far today), but I'm hoping they'll add more content with time. This app, originally called just "Learn Hiragana and Katakana" has since changed its name to RoboKana. It's goal is to teach you hiragana and katakana with a focus on handwriting. Each character is taught by showing you the stroke order in an animation, which then fades. 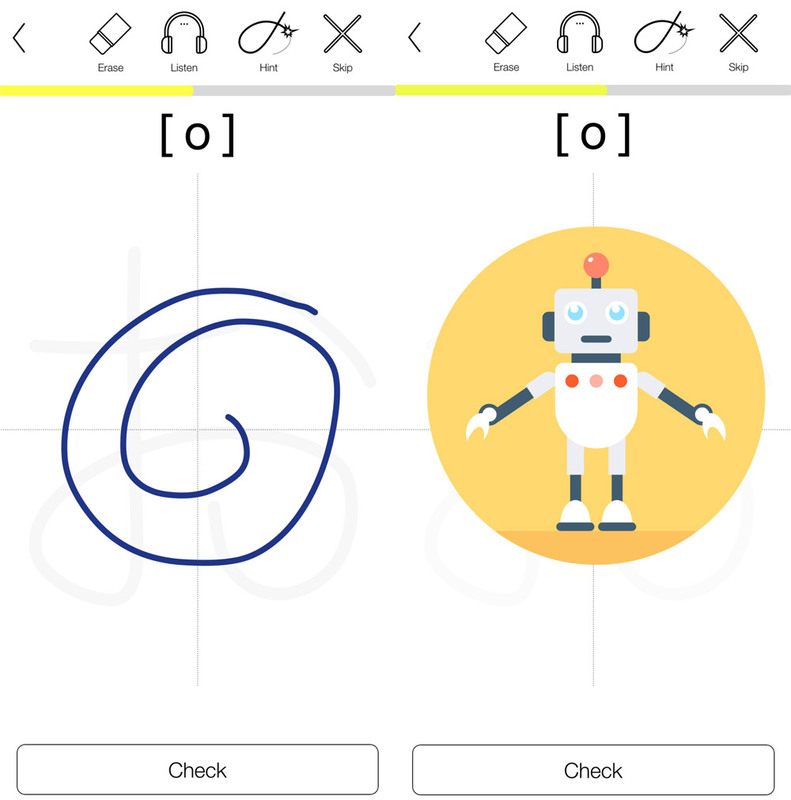 You trace the strokes and a little robot pops up to tell you whether you passed or failed. As you progress, the faded character eventually disappears, forcing you to remember it on your own. If you make a mistake, you can erase your strokes. You can listen to audio of each character and if you're having trouble remembering what a character looks like, you can ask for a hint or skip it until later. I was curious to see how accurate the robot analysis was, so I got a little loose with things. The app does not let you pass with just anything. It even stopped me from passing お a few times because my last stroke was going below where it wanted. I was pleasantly surprised by the strictness of my robo-friend! The vowels of both hiragana and katakana are free, so you can download the app and see if you like it before dropping three dollars on what is, essentially, a drawing tool replacement for a teacher. 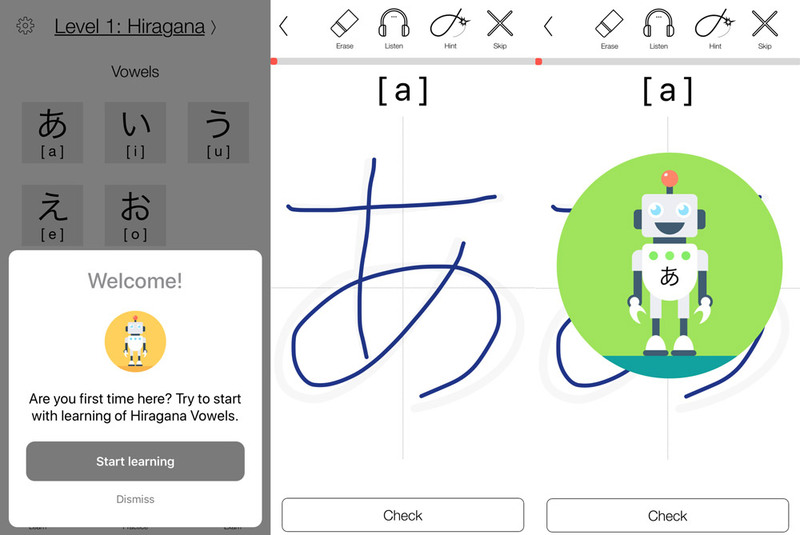 RoboKana is different from most of the "learn kana" apps out there though. Others mostly focus on multiple choice or basic flashcards. Hopefully it will expand to include more than just kana in the future and help more people with their stroke order and writing. What can I say? I'm a sucker for Terrace House and I love making sure everyone is as addicted to it as I am. But it's also a great learning tool! There's a new season, which I was binging in Japan, and the first part is now on Netflix in the US. The Japanese is real, non-scripted, and situated around everyday life. All of the housemates are native Japanese speakers. If you don't have access to Japanese TV, you only need a Netflix subscription to hear native Japanese! Learn some local dialect/slang from big brother Nakamura. Most of the scenes with voice audio are presented line-by-line, allowing you to wait before moving on to the next sentence… there are many opportunities in the game to take it slow and listen. The first Ni no Kuni game was really important to me. It got me to buy a PS3 well after the PS4 had been out. It hit all of the right Pokemon plus Studio Ghibli plus Final Fantasy vibes. And most importantly, it was a game I could play with Japanese audio at a time when everything was region locked. Ni no Kuni II: Revenant Kingdom was just released for PS4 and PC, and I was extremely excited to see they offered Japanese audio options for the English release once again! If you get the PC version on Steam, you can even change the interface to Japanese entirely. While I wouldn't say you have to play the first installment to enjoy this game, it helps you understand the land you're in and adds a nostalgia factor. Japanese audio for an English release of a game without having to have a Japanese version of the game and/or a Japanese PSN account (to get the region-matching version of the DLC, of which there will be five! FIVE!). A unique opportunity to listen to Japanese audio, then look at the subtitles for the English localization—not a direct translation of what you're hearing. This is especially interesting in Ni no Kuni because it's a game about uniting different groups of people, friendship, and emotions that don't always translate directly. The chance to listen carefully. Most of the scenes with voice audio are presented line-by-line, allowing you to wait before moving on to the next sentence. While cutscenes are automatic, there are many opportunities in the game to take it slow and listen. If you choose to play the game entirely in Japanese, be warned that there are a lot of puns and terms you may not have learned in your studies (this is a JRPG, after all). Take it as a chance to learn and explore, but if you haven't been exposed to JRPG inventories/language before, it could make getting through the game difficult. While Reajer isn't a new resource, it is a newly free one. 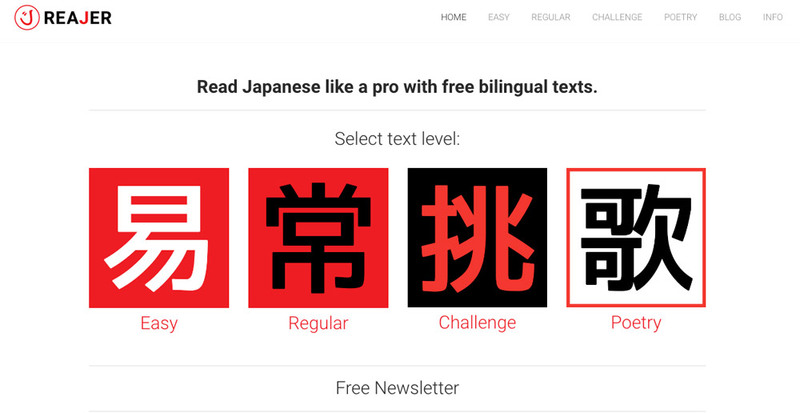 The site provides Japanese language texts to help you develop your Japanese reading skills with content broken down into four categories: easy, regular, challenge, and poetry. Each entry is divided into individual sentences, then the sentences are broken down into readings, a Japanese translation, and further explanations. Each entry is a manageable size—even "Challenge" section entries usually contain just a few paragraphs. And at the bottom, you can find the original text without any annotations or breaks, though the readings are still included for kanji words. If you're interested in getting into reading Japanese literature, but you don't want to pick up a physical book or take a class, this site offers a gentler introduction to that world. Update: Unfortunately, the Reajer website is no longer available. This is another way to make the most of NHK News Web Easy. NHK Easier pulls articles from NHK News Web Easy and adds a few helpful tools. You have the option to add furigana to everything, show furigana on hover, or none at all. You can also choose to have EDICT English translations appear on the left side of the screen when hovering or clicking on words. It's like having a Rikai extension without needing to add one to your browser of choice. 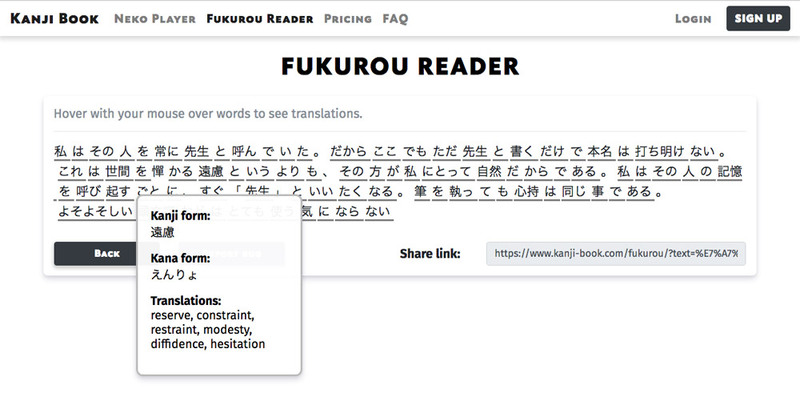 Yet another way to help you read easier, Fukurou Reader is a text helper by the people behind Kanji Book. Paste any Japanese text into the reader and hit "read" to parse everything out using EDICT and KANJIDIC dictionary support. Hovering over words shows you kanji and kana forms, as well as English translations. You can also share a direct link to the text with your friends, teachers, or whomever. Unfortunately, as is the case with most of these automatic parsing tools, verb conjugations are broken up incorrectly, and most grammar tends to get simplified. So while it may be helpful to the untrained eye, until they put more work into the parsers they use, it probably won't be very helpful for beginners, who will just end up with more questions than answers. 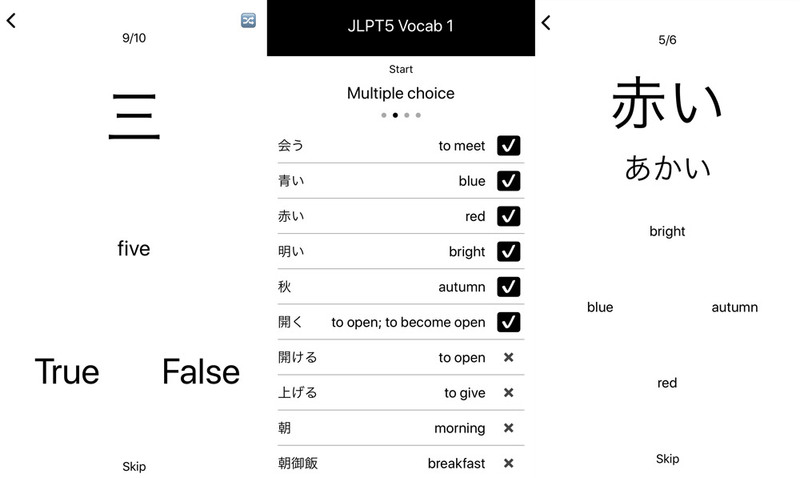 If these are the kinds of quizzes your teachers give in class, Pocket Japanese is a perfect study tool to use the night before, on the bus, or right before class starts. The ability to customize your quizzes is definitely the most useful feature, but the ability to add your own items, instead of scrolling through the entire list, would make it even better. More updates are supposed to be coming, so hopefully this apps gets more content and more customization options soon.